^ Berkman, Prison Memoirs, p. 91. ^ Trials and Speeches, p. 55. ^ Berkman, Bolshevik Myth, p. 91. Avrich, Paul (1988). Anarchist Portraits. Princeton: Princeton University Press. ISBN 0-691-00609-1. Berkman, Alexander (1989) . The Bolshevik Myth (Diary 1920-1922). London: Pluto Press. ISBN 1-85305-032-6. Falk, Candace (1990). Love, Anarchy, and Emma Goldman (2nd ed.). New Bruswick, N.J.: Rutgers University Press. ISBN 0-8135-1513-0. 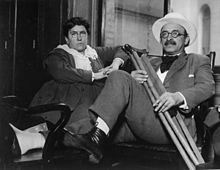 Trial and Speeches of Alexander Berkman and Emma Goldman in the United States District Court, in the City of New York, July, 1917. New York: Mother Earth Publishing Association. 1917. OCLC 808946. http://books.google.com/?id=f65YAAAAMAAJ. Wexler, Alice (1989). Emma Goldman in Exile. Boston: Beacon Press. ISBN 0-8070-7004-1.